The best solution is to avoid the ECG artifact in the first place. The problem is typically solved by adjusting the placement of the electrodes. Place the EMG electrodes so that they are NOT aligned with the axis of electrical activity of the heart. Placing both EMG electrodes (Vin+ and Vin- ) on the same side of the body will help. 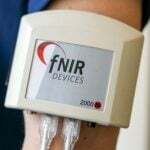 ECG artifact can be removed from EMG data that has been recorded by applying a 50Hz High pass FIR filter. The number of coefficients should be greater than or equal to two times the sampling rate, divided by the lowest cutoff frequency specified. For example, if running a low pass filter at 1Hz on data sampled at 100Hz, choose at least (2 X 100/1) or 200 coefficients in the filter. Additional coefficients will improve the response. Use a number four times higher.